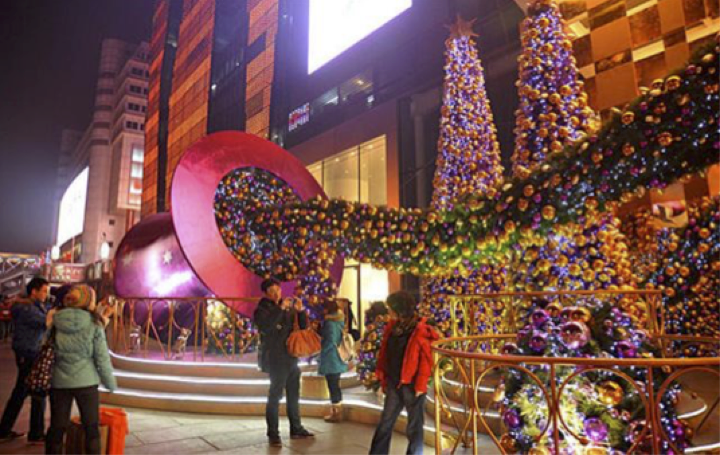 Christmas in China: Glitz, Glam & Apples? Although only an estimated 1% of Chinese identify as Christian, the number of Chinese who actively celebrate Christmas is skyrocketing. The commercial side of the holiday opposed to the religious Christmas holiday in China creates quite the spectacle in the country’s major cities. The holiday’s increasing popularity in China can be largely attributed to the country’s new consumption-heavy middle class. 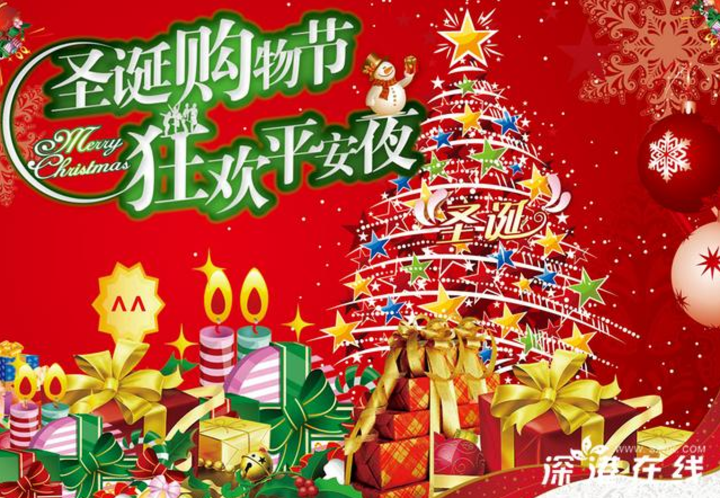 With more than 75 percent of China’s urban consumers slated to reach at least lower-middle class status by 2022, Christmas is a huge marketing opportunity in China. Like December in the US, the winter season now brings glitz and glam to the shopping malls, stores, and internationally-minded areas of China’s big cities. Street merchants' carts are stuffed with small Christmas tokens, the same trinkets we find on our American shelves (but even cheaper since they are manufactured there). Luxury stores also role out the red and green carpet with brands like Michael Kors offering Christmas big deals. 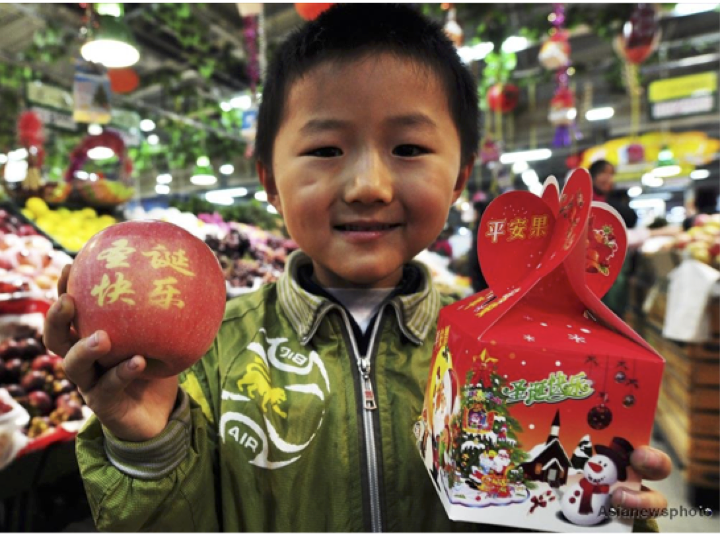 If you ever celebrate Christmas in China, you may be surprised when you receive an actual fruit as a gift instead of a fruitcake. Apple giving usually takes place on Christmas Eve in China because the word for Christmas Eve (平安夜/pingan ye) is so similar to the word for apple (苹果/pingguo). Stores have also seized this opportunity and began packaging and selling fancy apple gifts throughout the season like the carved apple below. Although the holiday is still becoming increasingly celebrated by many in China, there has also been backlash by those striving to protect traditional Chinese culture. Western influence and how to deal with it has always been a touchy subject for China’s people and government. Many feel that certain Western customs are being prioritized by younger Chinese and are actually pushing Chinese traditions out. In regards to one city’s school-wide ban on holding Christmas-themed events, an official was quoted suggesting, “We are not suppressing Western festivals, but we hope schools can be more balanced on this. Students can learn about Western festivals but they should not be over-enthusiastic about it." All this aside, Christmas in China is still similar to that of other countries in that it is recognized by much of the country’s younger generation as a time to gather with friends and family. As a seasoned producer of Christmas gifts and goods for other countries, China is finally beginning to utilize their own products and celebrate the more commercial side of the holiday, a side of the holiday that (let’s be honest) has also consumed most of Christmas in the West as well. It will be interesting to see how the future of Christmas in China unfolds and whether or not its popularity continues to surge.